Sheet for Bosch injectors that used to be sold by ringer racing.I believe they were advertised as 1150cc but sheet says 1200cc.Hope this helps anyone looking to go that big. 429,20 g/min (627,5 ccm/min) @ 3 bar. I wrote an email to motorsport@bosch.de / kundenberatung.kfz-technik@bosch.com and asked for technical data. Is this the still the current good data sheet for 117's? Just wanted to say thanks for this post... and highlight the importance of doing this "last step" in my transition from stock injectors to the EV14s (298s, Ford Racing GT500). I've owned my car for 5 years and have been refining my tune, with lots of help from ddilenger, S4Wiki and Nefmoto posts. My hardware changes (bigger turbos, injectors, fueling upgrade, RS4 MAF, etc) were completed years ago. Cold surging was my last, lingering issue and I think I've finally resolved it. I had bucking issues during cold start/warm up phase, struggling with them for quite some time. My warm engine tune is spot on, with RKAT and FRA both with trims of +/- 1%, varying some with air temps and different fuel, but never more than +/-3%. I initially assumed it was an enrichment problem (since I was trying to accelerate when encountering the lean out). Seems rational, right? I fucked with MAF curves, FKKVS, idle torque curves and KFBAKL to no avail. I only recently realized my lean out during warm up at engine speeds above idle was actually occurring during a decreasing load situation (load at cold idle is above the tip-in load). I know how weird this sounds, but my load decreased when coming off cold idle (1,000 rpm) and engaging 1st gear or accelerating in 2nd gear from a rolling idle (rpm ranging from 800 to 1500 or so). So, load driven accel enrichment, KFBAKL, was useless and the other steady state items I played with weren't appropriate for this transient condition. Only increasing KFWWL (appears to) ameliorate the issue. After increasing KFWWL and increasing the factory KFFWLW weighting curves at low load levels (low loads drop the weighting to almost zero), I think I might have actually addressed the issue. First attempt today showed much improvement, but I need to test again with higher values. Logs show lean out is still occurring, but it isn't as extreme and I didn't "feel" the car buck/surge like I've grown accustomed to experiencing. Strange enough, fixing the warm up curves, allowed me to set KFBAKL back to stock levels (much lower values than I had been running). And acceleration was smoother for it. I'm now thinking you only need to alter KRKTE, TVUB, FKKVS/FKKVSNWS and KFWWL/KFFWLW when converting to EV14s. The EV14s are so linear that FKKVS only needs moderate changes (from 1.00) at off idle injection (2 to 4 ms or so) and low rpms (1000 to 1500 or so). Hell, I might not require that with higher KFWWL values. KFBAKL tuning might offer throttle response improvements, but my tip-in lean out seems to be no worse than 5%, lasting no more than a fraction of a second, using stock values. So, big changes (50%+) to KFBAKL, like I've seen suggested in some posts here, shouldn't be necessary. Of course, I've only tuned my car, a 2001 Porsche 996 Turbo -- a sample size of 1. Your experience might be different, but I'll bet the turbo Audis using ME7 might be similar. So after all this... A big thanks to nehalem regarding his following post, which pointed me in the right direction. Just a check... 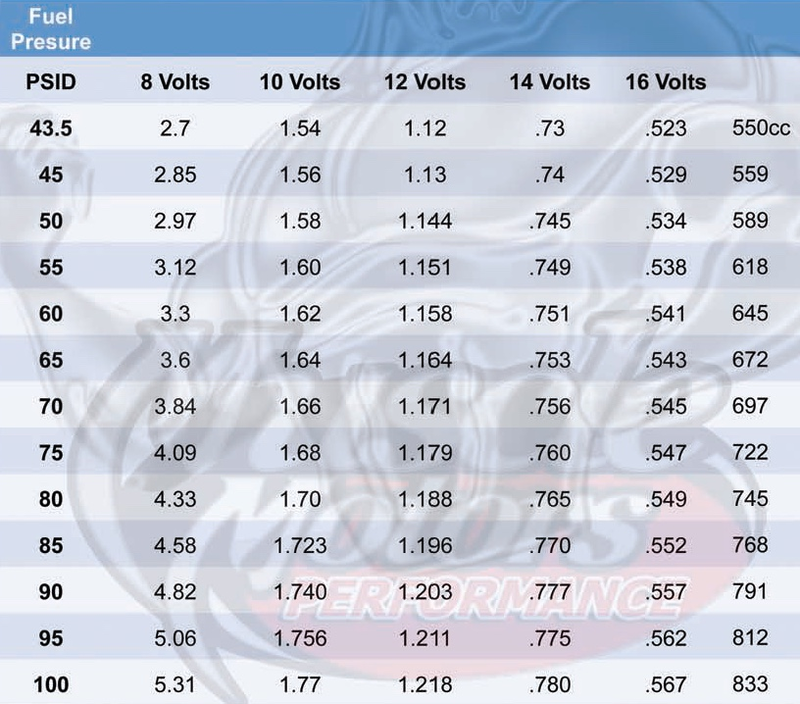 The TVUB values listed below for the 298s are for fuel pressure of 39.15 psi, the Ford GT500 standard. I suspect these values are too low for most of us and need to be scaled up by something similar to injector flow rate scaling. I'm running 65 psi fuel pressure and found the scaling factor of SQRT(65/39.15) to be almost spot on, at least for my typical 13.5 volts. Hi all. Maybe this help someone. AFTER 50km i have 7.8 partial LTFT and i adjusted it with 7%. Will inform what happen in few days.